It's Friday, and I am SO happy about that, more than usual. We've been in the midst of a nasty heat wave here in southcentral Alaska and we're finally getting normal temperatures back this weekend and this girl is ecstatic about that! Thankfully I had stamping to help keep my mind off the fact that I was melting :) This weeks Friday Mashup is brought to us by Amanda and she has a color challenge for us, as well as a technique! The technique is called Triple Time Stamping and I had never heard of it before. After googling it I thought it was going to be a bit tricky but it was actually a very easy technique to do. The hardest part for me was picking out a stamp set to use for it! To go along with this Amanda also wants us to use at least 3 of the following colors: Crumb Cake, Summer Starfruit, Pacific Point and Daffodil Delight. The only one I didn't use is Summer Starfruit. I know a lot of people like that color but I am just not a fan and avoid it at all costs. The third layer(the smallest layer on top with the sentiment) is popped up with dimensionals. 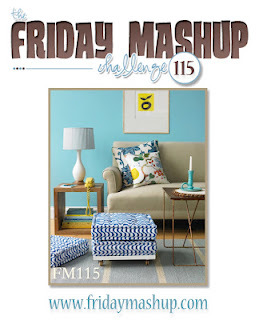 Make sure you head over to The Friday Mashup to see what the rest of the design team created for this challenge and then play along with us, we'd love to see your creations! Fun way to use the chevrons in your layout. That's a lot of stamp coloring! Very cool technique, Lisa! You did a fabulous job. I love the colors too. This is such a cool looking card! Great job! Love it! It's so symmetrical and perfect! Love the ribbon running under the top panel, too. This came out great Lisa.. I really like how you used the Challenge Colors and we were thinking alike with the Oh Hello set. Beautiful card Lisa. I love how you used that stamp set and combined the colors. 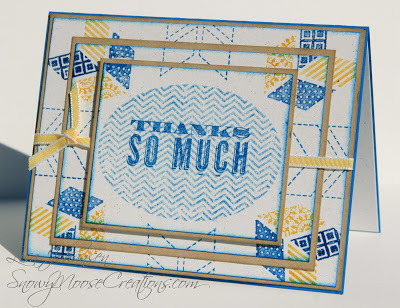 What a fab background effect Lisa - love the arrow effect with the Oh Hello set - so clever!! Beautiful way of using the colors! I really like how you alternated the direction of the chevrons making it look like they are pointing towards the greeting! Wonderful!